Dry brining: 1-2 days before roasting, dry the thawed turkey with paper towels. In a bowl mix together the salt, chile powder, and oregano. Rub the mixture all over the turkey, under and over the skin and in the cavities. Cover tightly with plastic wrap and refrigerate. When ready to cook, remove the turkey from the refrigerator about 1 hour before roasting. Remove the plastic wrap, and if the turkey seems excessively moist, pat it dry with paper towels. Preheat oven to 400°F. Rub butter under the skin and in the cavity. Stuff the cavity with the onion and carrot. Set the turkey on a roasting rack set inside of a roasting pan. Add the stock or wine to the pan. Roast the turkey for 1 hour, then reduce the heat to 375°F. Continue to roast, basting the turkey occasionally with the pan juices, for 1 hour or until the the temperature reads 165°F in the thickest part of the breast away from the bone or 170°F in the thickest part of the thigh away from the bone. If the turkey starts to darken too quickly, lay a piece of aluminum foil over the top. Remove the turkey from the oven, transfer to a carving board, loosely tent with foil, and let rest for 15 minutes before carving. Here's a method for carving the Thanksgiving turkey. It is performed in the kitchen and not at the dining table. 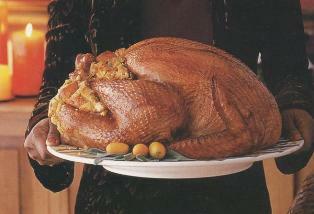 The carved turkey will be easier to serve, eat and the leftovers will be a snap to put away. Rinse turkey inside and out with cold water; pat dry with paper towels. Trim excess fat. Place turkey in large nonreactive bowl. Starting at neck cavity, loosen skin from breast and drumsticks by gently inserting fingers between skin and meat. Sprinkle kosher salt and pepper under and over skin. Then spread garlic-herb rub under skin and gently press skin to adhere. Lift wing tips up and over back; tuck into turkey. Refrigerate at least 8 hours or overnight. Let turkey stand at room temperature 1 hour before serving. Set oven rack at lowest position and preheat oven to 350°F. Brush turkey with olive oil and carefully transfer to rack. Brush one side of double-folded sheet of aluminum foil with olive oil and tent, greased side down, over turkey breast. Place turkey in oven so legs face back of oven and bird, breast side up, faces door. Place wrapped garlic on oven rack. Roast 45 minutes, Remove garlic from oven. Remove foil from turkey and turn pan around. Roast until thermometer inserted in thickest part of thigh registers 170°F and juices run clear when thigh is pierced with fork, about 1 hour 15 minutes. Transfer turkey to platter and reserve pan drippings. Let turkey stand 20 minutes before carving. Separate roasted garlic cloves. Squeeze pulp into small bowl and mash well with fork. In medium saucepan over medium heat, heat reserved fat. Add garlic and flour, and cook, whisking constantly, until lightly browned, about 30 seconds. Gradually whisk in broth mixture. Bring to boil over high heat, whisking constantly, and remove from heat. Carve turkey and serve with gravy. In a bowl, mix the bourbon, orange juice, maple syrup, thyme an at least 1 teaspoon each salt and pepper. Preheat oven to 325F. Bring turkey to room temperature before roasting. 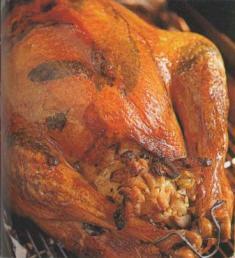 Rub at least 6 tablespoons of the butter under the breast skin of the turkey and rub the remaining butter over the skin. Tie the legs together with twine and place bird in a large roasting pan. Pour 1/2 cup of the bourbon mixture into the pan and roast turkey for 30 minutes. Baste the turkey with the pan juices and add 1 cup of water to the pan. Roast for 1 hour longer, basting every 30 minutes. Add the remaining bourbon mixture to the pan, cover loosely with a foil tent and roast for about 2 hours longer or until an internal temperature of 165° is reached. Keep turkey covered and let rest for at least 30 minutes. FOR THE GRAVY: Skim excess fat from pan juices, reserve. In a bowl, mix about 6 tablespoons of fat with the flour to form a paste (add additional olive oil if necessary). In a medium saucepan, warm the stock and slowly whisk in the flour paste. Bring to a boil over moderate heat, whisking constantly. Add the pan juices, reduce heat to low and continue whisking until thickened, about 20 minutes. Season with salt and pepper and stir in pecans. Serve warm with turkey. Spatchcocking refers to a process of cutting a turkey in preparation for cooking. Some recipes will call for splitting the bird in half or "butterflying". This is the same process. This method will decrease cooking time, render more fat and create extra crispy skin. Adjust oven rack to middle position and preheat oven to 450°F. Line a rimmed baking sheet or broiler pan with aluminum foil. Place wire rack on top. Combine garlic, parsley, sage, thyme, and shallots in the bowl of a food processor. Pulse until finely chopped. Put butter chunks on top. Pulse until well blended. Season with salt and pepper and pulse to combine. Using about half of the mixture, gently separate the skin of the turkey from the flesh from the bottom of the breast to the top working up along both breast halves and the thighs. Rub the herb butter onto the meat underneath the skin, distributing evenly. If using, add vegetables and broth to the bottom of a large roasting pan. Rub the outside of the turkey with the remaining butter until evenly coated. Generously season the turkey with salt and pepper and transfer to the wire rack in the roasting pan. Roast, rotating the pan occasionally if necessary, until an instant read thermometer inserted into the deepest part of the breast registers 150°F, and the thighs register at least 165°F, about 80 minutes. Remove from oven and allow to rest at room temperature for 20 minutes before carving. Remove cooked turkey and wire rack. Discard vegetables and herbs. Pour drippings into a bowl or fat separator leaving all brown particles in the pan. Let fat rise to top and skim off and discard all but about 1/4 cup. Reserve meat juices. Add fat back into the roasting pan and place over low heat. Blend in 1/4 cup flour and cook until slightly brown and bubbly. mixture is thick. Season to taste with salt, pepper and fresh thyme leaves, sage and parsley. Rinse the turkey breast. Mix salt and sugar in 11/2 gallons cool water in large clean bucket or stockpot until completely dissolved. Set turkey breast in brine, making sure it is submerged. Cover and refrigerate 5 hours. Twenty minutes before roasting, adjust oven rack to middle position and heat oven to 450 degrees. Mix room-temperature butter with pepper in small bowl. Set aside. Remove turkey breast from brine and pat dry thoroughly. Place turkey breast in oven. Pour white wine or stock over pan bottom to prevent drippings from burning. Roast 15 minutes, then rotate roasting pan. Roast until skin turns golden, 15 minutes longer. Reduce oven temperature to 325 degrees; continue to roast turkey breast, rotating pan once, about halfway through cooking until internal temperature in deepest part of breast registers 160 to 165 degrees, 30 to 45 minutes longer. Remove turkey breast from oven. Let stand 20 minutes. Carve and serve. Heat oven to 325ºF. Place breast, skin side up, in shallow open pan. Brush lightly with oil. Roast 1-1/4 hours. Remove from oven; place carrots and onions around turkey and continue roasting 30 minutes. Meanwhile, stir together honey, vinegar, lemon pepper and paprika. Brush turkey with honey mixture and drizzle the remaining honey mixture over the vegetables. Continue roasting 30 minutes or until breast reaches an internal temperature 160 to 165ºF. Halfway through the last 30 minutes, stir vegetables to glaze with pan juices. When breast is done, let stand 10 minutes before carving. Remove vegetables from pan with slotted spoon; keep warm and serve alongside the turkey with pan juices. Heat oven to 325°F. Place turkey breast, skin side up, on rack in shallow roasting pan. Roast uncovered 1 hour. Mix wine, honey, soy sauce, ginger root and garlic. Brush turkey with wine mixture. Roast uncovered about 1 hour longer, brushing turkey frequently with wine mixture, until thermometer reads 170°F and juice is no longer pink when center of turkey is cut. Discard wine mixture. Pour pan drippings into measuring cup; skim off any excess fat. Add enough water or low-sodium chicken broth to drippings to measure 1 cup. Heat drippings to boiling in 1-quart saucepan. In a small bowl, mix cornstarch and cold water; stir into drippings. Boil and stir 1 minute. Serve with turkey.